If you’ve always wanted to add an Apple reality distortion field to your action figure collection, here’s your chance! The illustrious iCEO, Steve Jobs, has been crafted into miniature form, complete with his trademark black turtleneck shirt, Levi’s 502 jeans, New Balance sneakers, and beard. 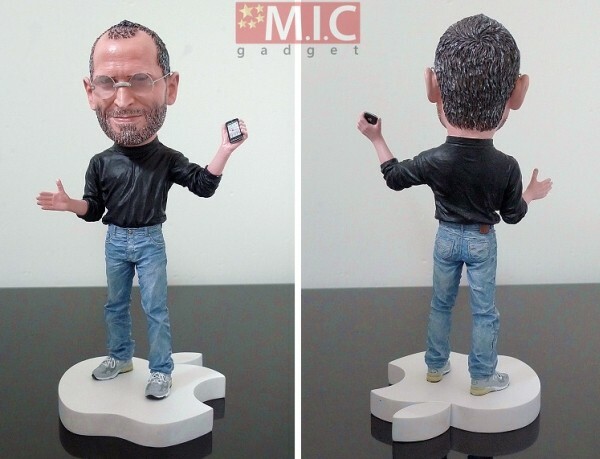 He also comes with rimless glasses, a mini iPhone 4, and an Apple logo to stand on. The $79 figurine is highly detailed and even comes with a set of speech bubble cards that you can mount next to him, so your playtime routine can include such gems as “People don’t read anymore,” “I’ve always wanted to own and control the primary technology in everything we do,” “It turns out people want keyboards…we look at the tablet, and we think it is going to fail,” “We have always been shameless about stealing great ideas,” and more. Check out M.I.C. Gadget for more photos and ordering info. Update (11/23): Apple has of course issued a cease-and-desist notice to the site selling these, so unfortunately no more Steve Jobs toys!